This is a letter of support for the brave students who stood up to express their political views against the university sponsored speaker, Jonathon Zimmerman, on December 1, 2017. Policies that foster oppression inhibit freedom. We therefore urge you to adopt well-reasoned free speech policies that protect true free speech. An accurate comprehension of free speech in the context of college campuses is imperative for universities to understand, since free speech on campuses has been under assault by forces whose veiled intent is to curtail diversity of perspectives and impose conservative values over others. Reactionary organizations, like the Federalist Society, have intentionally courted and heavily influenced school policies on free speech across the country for decades. They are intent on transforming laws and educational institutions that have been traditionally fertile ground for the highest scholarship, learning, freedom of thought, and growth into places that places further their own political agendas. A small group of students at Western Washington University (WWU) attempted to reveal the perniciousness of the Mr. Zimmerman’s interpretation of “free speech.” It seems the administration has unfortunately chosen to dismiss their concerns and instead discipline them. We believe that your decision to discipline the students hurts WWU’s endeavor for higher learning and education. Free speech and the First Amendment should not be interpreted and implemented in the abstract. The reality is our society is deeply divided into populations of those with wealth and power and those who suffer discrimination and poverty. The divide generally cuts along race and class with members of these communities having less access to participate in their own governance, politically and socio-economically. They have less access and opportunity to spaces where they are invited, heard, or have equitable participation. People of color, trans, queer, and non-binary people’s views are expressed on an unequal playing field. Therefore, giving privileged, relatively well-resourced speakers and positions “equal” access to free speech is not an exercise in promoting equality or free speech. It is a preference. Free speech occurs when realistically everyone has the same opportunities and circumstances to participate. When an institution “equally” supports viewpoints such as Mr. Zimmerman’s or people and groups which threaten and further marginalize certain populations, it is not free speech that a school is promoting. WWU may view its current decisions as justified, but this view is misguided. Liberal institutions and groups may erroneously think devoting resources to all speech is free speech. Recently, the bastion of liberalism in the U.S., the American Civil Liberties Union, came under attack for their irresponsible defense of white supremacists in Charlottesville to exercise their so-called First Amendment rights which advocated for and resulted in violence and death. In contrast, when a responsible institution of higher education assesses free speech, it should consider the following: 1.) Who is allowed and able to speak? 2.) Under what conditions and with what consequences? 3.) What voices are patently silenced? 4.) What forms of dissent are allowed or not, considering the imposed limitations and discrimination of marginalized people? A university can make a responsible decision about free speech only after diligently analyzing these questions to balance the complexities of our diverse populations. Under the Trump administration, erosion of free speech has been accelerated, so it is important to bring attention to this issue. We, the Whatcom Civil Rights Project, are concerned about the attacks on our civil rights and how to effectively address them. We recognize that civil rights and free speech are under attack by powerful and reactionary forces which have obfuscated the concept of free speech into an abstract interpretation of it, ignoring its true intent and steering even institutions of higher education away from actually promoting a diversity of ideas, learning and fostering growth on their campuses. Jonathan Zimmerman is a white man of relative privilege, who is advocating for free speech without the necessary analysis and just balancing. His free speech should not be valued over the free speech of your students, protesting the presentation on December 1st. Even more true, the students were expressing their political speech even though it was not welcomed. They risked their safety and comfort to express their political views. This exemplifies intelligence and knowledge which most likely was learned from and fostered by their university education. The students were rightfully protecting the silencing of marginalized voices. Mr. Zimmerman’s misguided position that free speech should be extended regardless of the violent nature of a group, an individual, or a statement borders on endorsing violence for those who oppose violence and oppression. It is public knowledge that hate groups and xenophobic speakers have a history of inciting violence, and they are often directly associated with hate groups whose tactics include violence and intimidation. Should a university wait for the outbreak of violence before they act? WWU’s priority in promoting diversity, safety and an environment conducive for the highest learning is laudable. However, to apply First Amendment rights only in concept, without considering the disparate treatment of some student populations and balancing challenges they face hurts the environment that WWU seeks to foster. When institutions do not understand how to protect the First Amendment right to free speech, they will surely lay the path for fascist forces to take hold and destroy it. Bellingham, WA- Responding to threats of violence and misrepresentations in multiple media outlets, students most affected by the recent violence at Western Washington University will make a public statement at 10am on Wednesday, November 25th. Supportive members of the Western and Bellingham communities invite the press to join us at the Whatcom Peace and Justice Center for this statement at 10AM. Beginning with a series of racist comments posted online in response to inaccurate reports filed about Western’s mascot, the campus has been shaken by an escalating series of threats that resulted in the cancellation of classes on November 24th. Social media posts have included threats of both sexual violence and gun violence directed at students of color as a whole and against individual women of color who serve as campus leaders. These student leaders were rebuffed in their attempts to seek aid from campus law enforcement on the night of November 23rd and are asking the public to hold Western accountable for keeping students safe. President Shepard’s widely quoted statement has established a false impression that the issue is being resolved and that students feel safe. As these students will attest, there are ongoing concerns about these students’ safety both on and off campus. We strenuously object to President Shepard’s characterization of this situation as “no threat to general campus safety” as if the young women under threat are not integral members of our campus community. This incident is not an aberration on this campus or for other students of color on college campuses across the country. On the other hand, we agree that this campus must “plan responses that will make us stronger.” Listening to these students will be a crucial first step towards that desired strength. Pursuant to RCW 42.17A, be advised of the following civil rights violations and reasons to believe RCW 42.17A is being or has been violated. The flyer attached hereto as Exhibit A (“Flyer”) was mailed to select registered Whatcom County voters for the promotion of Whatcom County Ballot Proposition No. 1, and Whatcom County Proposition No. 2015-1 and for the purpose of assisting a campaign for the election to public office. This Notice incorporates the facts reported in the October 15, 2015, Bellingham Herald Article (Whatcom County uses tax revenue to send mailer about jail tax measure), attached hereto as Exhibit B. Whatcom County, Whatcom County Executive Jack Louws, Whatcom County Prosecutor Dave McEachran, and Whatcom County Sheriff Bill Elfo, and other unknown individuals used funds and facilities of a public office or agency, or agencies (directly or indirectly), including the County Executive’s Office, the Sheriff’s Department, and the Prosecutor’s Office for the purpose of assisting the promotion of the two ballot propositions and for the purpose of assisting the campaigns for election of Louws and Elfo. No elective official nor any employee of his or her office nor any person appointed to or employed by any public office or agency may use or authorize the use of any of the facilities of a public office or agency, directly or indirectly, for the purpose of assisting a campaign for election of any person to any office or for the promotion of or opposition to any ballot proposition. Facilities of a public office or agency include, but are not limited to, use of stationery, postage, machines, and equipment, use of employees of the office or agency during working hours, vehicles, office space, publications of the office or agency, and clientele lists of persons served by the office or agency…. A.The Flyer is an impermissible attempt to influence the outcome of the ballot propositions. The Flyer is a one-sided pitch for mass incarceration. The Flyer completely omits the incarceration facts being examined nationwide at all levels of government. Having examined cost and injustice of our 40-year history of mass incarceration, Republicans, Democrats, Police Chiefs, and Prosecutors nationwide are calling for reduced incarceration. The nation is becoming aware that the U.S. holds 25% of the planet’s incarcerated people, yet has only 5% of the planet’s free population. We as people of color in Whatcom County are especially concerned about mass incarceration and the potential ramping up of mass incarceration in Whatcom County, especially with our proximity to the northern border and the large presence of Homeland Security. The Whatcom County Jail is disproportionately filled with people of color. With this notice, we therefore intend to put Washington, Whatcom County, and local law enforcement on notice of the existing civil rights violations, and our belief that ramping up mass incarceration while ignoring the system’s racism is a deliberate exacerbation of ongoing racial profiling and civil rights violations. The Flyer, and the three proponents’ (Louws, Elfo, and McEachran) support of the Flyer, increases the level of distrust that communities of color have in Whatcom County law enforcement system. Mass incarceration is a racist system implemented at the end of, and in reaction to, the gains made during the Civil Rights era. Today, we have a prison-industrial complex expanded to include immigration detention. The Administration, several Congressional leaders, and conservative groups agree that mass incarceration is a serious issue that needs to be addressed throughout our country. The Department of Justice recently announced they are releasing 6,000 prisoners. In Whatcom County, community members and groups have fought for the last decade to bring attention to local leaders and law enforcement, regarding issues of racial profiling and the racially disproportionate population in Whatcom County jails. The entire country is waking up to years of systemic racism and injustice thanks to community awareness, activism, and books like Michelle Alexander’s The New Jim Crow: Mass Incarceration in the Age of Color Blindness. “More than 130 of the nation’s top law-enforcement officials including big-city police chiefs, sheriffs, prosecutors and attorneys general, have joined the call to end the harsh, counter-productive practices and policies that have driven America’s [mass incarceration] boom, destroyed communities and written off an entire generation of young men of color.” In contrast to reality, a voter reading the Flyer would come away with the impression that there is no alternative to increasing the size of Whatcom County’s jail. The Flyer was created, in part, by the company hired by the County to provide “full design services” and “assistance in developing a coordinated message and developing graphics to support the message.” The October 1, 2014, DLR Group Contract for Services Agreement is attached hereto as Exhibit C. Local government agencies “...shall not coordinate informational activities with campaign efforts, in a manner that makes the agency appear to be supporting or opposing a ballot measure.” January 12, 2015, PDC Letter. The overcrowding is the result of the unlawful mass incarceration policies (including bail recommendation, sentence recommendation, and good time policies) of Whatcom County and the three mass incarceration proponents quoted in the Flyer (Louws, McEachran, and Elfo). WCC 1.28.100 requires, amongst other things, that Sheriff Elfo release inmates early or transfer them when it is overcrowded. Sheriff Elfo and Prosecutor McEachran are also the main architects of overcrowding and unsafe crisis of the jail. The jail was deliberately and illegally overcrowded in order to manufacture a crisis that could be used to justify plans to increase Whatcom County’s capacity to incarcerate 521 (or more) inmates at a time. There is no analysis regarding incarceration rate, or even information assisting the voters in deciding that they should incarcerate more, the same, or fewer people than they do already (e.g., whether they should incarcerate 523, 403, or whether they should reduce incarceration rates by 25% to 300). This voting period (ending November 3, 2015) was scheduled to occur two (2) months before the publically funded Whatcom County jail alternatives task force is scheduled to make recommendations; that is, if the proposed tax is passed, 30 years of taxation (roughly $120,000,000) will be unavailable for alternatives to incarceration. To fall within the WAC 290.05.271 exception, public offices or agencies must make “facilities available on a nondiscriminatory, equal access basis for political uses or [make] an objective and fair presentation of facts relevant to a ballot proposition, if such action is part of the normal and regular conduct of the office or agency.” Further, public funds or resources may only be expended if “the preparation and distribution of information is not for the purpose of influencing the outcome of an election.” PDC Interpretation No. 04-02, Page 4. “Supervisory personnel have a duty to know, apply, and communicate to their staffs the difference between acceptable information activities and inappropriate promotional activities in support of local government ballot measures.” Id. “[I]n no case will the PDC view a marketing or sales effort related to a campaign or election as normal and regular conduct.” Id., at 5. The Washington Public Disclosure Commission (PDC) has advised, “Such a presentation must accurately portray the cost and other anticipated impacts of a ballot proposition, and must not promote or oppose the proposition in the tenor or tone of the language used.” January 12, 2015, Public Disclosure Commission Letter to Local Government Agency Officials from Tony Perkins, Acting Assistant Director, Re Election-Related Communications by Local Government Agencies (“January 12, 2015, PDC Letter”). “Such a presentation should also explain, in neutral, factual terms, the outcome anticipated if the proposition is rejected by voters.” Id. [A]n “objective and fair presentation of the facts” must avoid . . . Overtly promotional or oppositional content (including inflammatory or emotionally-driven language; check marks and other indications of support; and gratuitous photos that tend to provoke an emotional reaction—e.g. an image of a body on an EMT stretcher, or a house exploding in flames).” Id. (emphasis in original). “ ‘Objective and fair presentation of the facts’ means that in addition to presenting the facts, the materials should present accurately the costs and other anticipated impacts of a ballot measure.” (January 12, 2015 PDC letter) The Flyer uses official uniforms, equipment, and publications, the us of which is restricted in the January 12, 2015, letter. The facts outlined in this notice, including 1 through 33, above, demonstrate reason to believe the foregoing legal requirements have not been met. B. The Flyer contains false statements, conflations, and gives the voters false impressions. Conflates safety and incarceration rates. We agree that the Whatcom County jail should be safe. But safety does not immediately mean building a bigger jail when and where the flyer describes. C. The Flyer is not normal, customary, and regular conduct. The Flyer was created, in part, by the company hired by the County to provide “full design services” and “assistance in developing a coordinated message and developing graphics to support the message.” According to Louws, the Flyer was specifically approved in a $27,000+ funding measure passed by the County Council. The flyer is unusual, and unlike previous information mailed to voters on other issues, including other ballot initiatives. Passage of a tax that maxes out the ability of the County to charge tax for public safety issues for 30 years is not a normal and regular event, and creation of the Flyer is not normal and regular conduct. Passage of Proposition 1, which will likely permanently reduce the voice of voters of color in County government is not normal and regular conduct. Further, the County Executive who approved the Flyer has profited from sale of land next to or around the proposed jail. Normal and regular conduct of a public office or agency, as that term is used in the proviso to RCW 42.17A.555, means conduct which is (1) lawful, i.e., specifically authorized, either expressly or by necessary implication, in an appropriate enactment, and (2) usual, i.e., not effected or authorized in or by some extraordinary means or manner. No local office or agency may authorize a use of public facilities for the purpose of assisting a candidate's campaign or promoting or opposing a ballot proposition, in the absence of a constitutional, charter, or statutory provision separately authorizing such use. “The agency must be able to demonstrate that for other major policy issues facing the jurisdiction, the agency has customarily communicated with its residents in a manner similar to that undertaken for the ballot measure.” PDC Interpretation No. 04-02, Page 5. In the event communications other than a “jurisdiction-wide mailed “fact sheet,” are used, . . . the agency must be able to demonstrate that . . . the method, format, and frequency is typical of how the agency routinely communicates with its audience.” January 12, 2015, PDC Letter. D. The Flyer is an electioneering communication that identifies political candidates and supports local political campaigns without having been submitted to voters for approval. Louws and Elfo are running for re-election in this voting period. They are photographed and quoted in the Flyer as authorities on the subjects. The Flyer is designed to minimize and divert attention from their roles in creating the overcrowding situation. A county, city, town, or district that establishes a program to publicly finance local political campaigns may only use funds derived from local sources to fund the program. A local government must submit any proposal for public financing of local political campaigns to voters for their adoption and approval or rejection. October 22, 2015, New York Times Editorial, citing position of Law Enforcement Leaders (lawenforcementleaders.org). NW Citizen article by Tip Johnson, http://www.nwcitizen.com/entry/louwsy-jail-deal. In the age of mass incarceration, in which the U.S. has 25 percent of the world’s prison population, but just 5 percent of the world population of people, we should be following a path that leads to putting fewer people in jail. Though these rates may seem appalling, they are probably underestimated: Stop and searches of people of color are not reported by law enforcement and many community members of color have stated that they are cited as “white” when they clearly are not. The disparate impact of more people of color and marginalized people jailed in our communities is the result of various points of failure in our criminal justice system, not just on the first frontline of law enforcement. The reality of racial profiling and biased policing is a significant and large component of our jail issue, as our arrest and jail population rates indicate. This is a national issue that is widely talked about. We should do not dismiss Bellingham and Whatcom County as exceptional. Science shows racial bias is a nationwide problem. Targeted local communities have known this for years, and mass incarceration is the most recent chapter in a long local history of exclusion, racial violence, and discrimination. Eliminate the bail system, which unfairly targets the poor for incarceration. Implement meaningful community policing alternatives such as L.E.A.D. and Smart Justice, which have proved effective in reducing crime. The Bellingham Herald published this editorial cartoon last Sunday that RJC feels mocks our objections to Bellingham acquiring predictive policing software. It depicts law officers calling local people of color “uninformed individuals” for speaking out against practices that institutionalize racial profiling. Please send a letter to Herald editor Julie Shirley voicing your objections to this coverage. Here’s a sample -- feel free to use this or adapt to fit your perspective. I am a community member of Whatcom County and I am writing to express my deepest concern about a cartoon published in the Sunday, August 30, Herald Opinion cartoon section by Rik Dalvit. 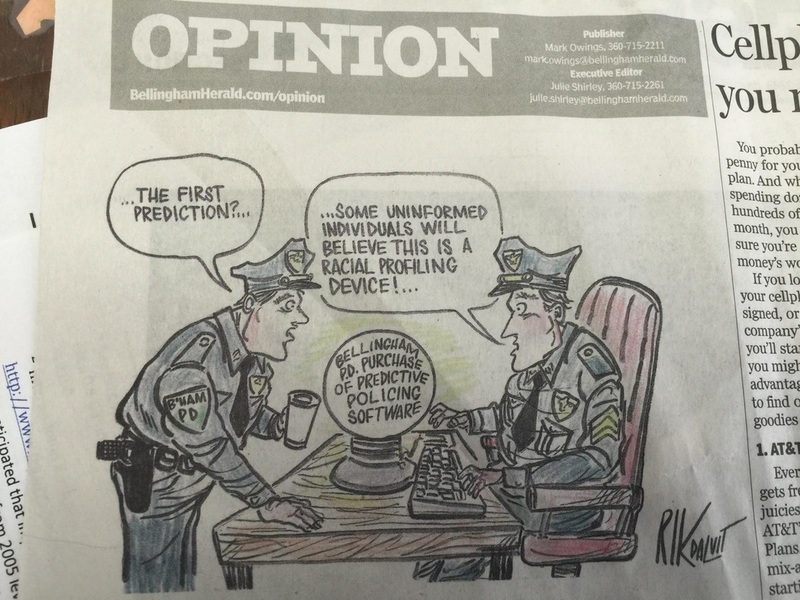 The cartoon depicted two police officers ridiculing the response of local communities of color to the police department and Mayor Kelli Linville’s decision to purchase predictive policing software for the City of Bellingham. Local communities of color find that this software can be used to racially profile people of color in this community who frequently experience harassment by local law enforcement agencies. I believe these concerns are valid, not to be ridiculed, and it is shameful that the Herald would publish such a biased, micro-aggressive, and marginalizing image under the guise of humor. It is already humiliating and dehumanizing to be treated differently from the dominant culture in this community. It is further dehumanizing to be ridiculed for speaking up about it. I urge you to exercise increased sensitivity in the messages you are sending to the people of color in this community who are growing in population. I also ask that you print a retraction of the cartoon and issue an apology in the cartoon section this Sunday to the people of Whatcom County for publishing this insensitive cartoon. Let us know that you’ve taken action -- please email racialjusticecoalition@gmail.com after submitting your letter to the Herald. We’d like to keep track of how many letters are submitted. You can read more about our objections to the software here. http://www.whatcomcivilrightsproject.org/blog/petition-to-mayor-linville-stop-predictive-policing-in-bellingham. What it boils down to is this: The software plugs in data collected through biased policing to justify increased police patrols of neighborhoods unfairly affected by bias. Bad data in, bad data out. Please go to thepetitionsite.com/787/872/078/kelli-linville-stop-predictive-policing-in-bellingham to sign our petition to the mayor. Despite vocal public opposition, our police department is moving ahead with acquiring the software, and our elected officials say there’s nothing they can do to stop Chief Cook. Our concern: Bad data in, bad data out. Plugging in data collected through biased policing will lead police to increase their patrols of the communities unfairly affected by bias. This is not about Bellingham police being good or bad cops. We do not have the data to determine whether Bellingham police racially profile more or less than other law enforcement agencies – because our police department does not currently collect sufficient data. What we do know is that racial profiling happens everywhere, and that it is bad in Washington State. This study debunked the myth that people of color are incarcerated at disproportionate rates because they commit more crimes. It showed instead that bias distorts decision-making throughout the criminal justice system. When Police Chief Cook says that neighborhoods with people of color are policed more because that’s where more crimes are committed, he’s wrong. They are neighborhoods where his department’s existing data say more crimes are committed. Mayor Kelli Linville and Police Chief Clifford Cook already know this. Members of BASOW, Racial Justice Coalition, and other community groups have met with them multiple times in 2015 to present concerns. Instead of engaging with the solutions we propose, the mayor and the Bellingham Police Department is moving ahead with software that threatens to entrench racial profiling, digitally. Tell the mayor to stop predictive policing software from coming to Bellingham, and engage instead with community concerns. Update: Read more about Monday's City Council hearing in this Bellingham Herald article: "Bellingham police to get predictive policing despite concerns"
The Bellingham Racial Justice Coalition was joined by members of the community for a rally in front of Bellingham City Hall before Monday’s City Council Meeting. The group opposes the Bellingham Police Department’s proposed purchase of “Predictive Policing” profiling software, citing a lack of transparency and reasonable notice, and risk of further institutionalizing various forms of police profiling. The Racial Justice Coalition is a group of concerned community members and organizations seeking to end systemic racism that manifests itself by racist institutional practices and policies. One such institutionally racist practice is racial profiling which leads to the disproportionate stopping, frisking, detaining, arresting and incarceration of people of color nationwide and right here in Whatcom County. The RJC is concerned with the short notice that was given for the community to educate itself regarding the methods by which the Bair program determines which neighborhoods should be the target of extra police actions. Historically, and presently, data presented by law enforcement implies that people of color commit more crimes. The biased policies used by law enforcement, however, lead to more charges and arrests of people of color. If biased data is put into the program, the program will give police biased predictions and data. The RJC asks that the council vote that the city not pursue this grant until the city can obtain the metrics by which the program makes recommendations, and the community is given time to investigate the decision making process and resulting impacts on people of color. The group gathered in front of City Hall at 6:30 pm. The event provided an opportunity for community reflection about systemic racism. Bellingham Racial Justice Coalition organized the rally, and included people from diverse races, ages, abilities, and religions. People attending the event held signs that read “Predictive Policing=Profiling”, “Predictive Policing≠Community Policing, “Stop Racial Profiling,” "White Silence = Violence" and "Stand Against Racism." WHAT: The Racial Justice Coalition opposes the Bellingham Police Department’s recent proposal to purchase software that may result in more racial profiling, until the impacted community has an opportunity for input and more information. WHO: The Racial Justice Coalition’s mission is to educate our community about racism through nonviolent action based in love and truth. Its vision is a community that is safe, compassionate, and equitable for all people. The RJC is building a movement for racial justice in Bellingham and Whatcom County, and focuses on challenging systemic racism.